During their sessions, students will gain a unique perspective on potential careers from the best source—local industry professionals! Northrop Grumman, Lockheed Martin, Arkwin Industries, and North Shore LIJ Health System have joined over 25 other businesses to encourage students to learn how vital a local talent pool will be for the sustainability of their companies on Long Island. In addition to industry professionals, representatives from the higher education sector will discuss their role in providing the foundation students will require to obtain careers in the S.T.E.M. fields. “The Cradle is proud to provide a link between the business and educational communities to help form an interest in STEM careers. The aim is to build awareness to the job opportunities that exist right here on Long Island.” said Andrew Parton Executive Director at the Cradle of Aviation Museum. 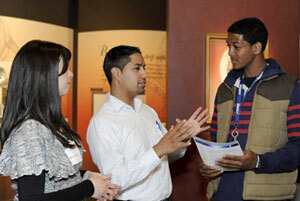 Students will rotate through various stations set up throughout the museum galleries. Each group will be small to enhance the discussion between company representatives and students in these various disciplines. The S.T.E.M. Expo will run from 9am till 1:30pm. Opening remarks will be made by NASA Astronaut, Marsha Ivins and Mr. Peter Rettaliata, CEO of Air Industries. School representatives should contact Catherine Bingham, Education Coordinator at 516-572-4028 for more details.